Breakfast Cannot be better than this. 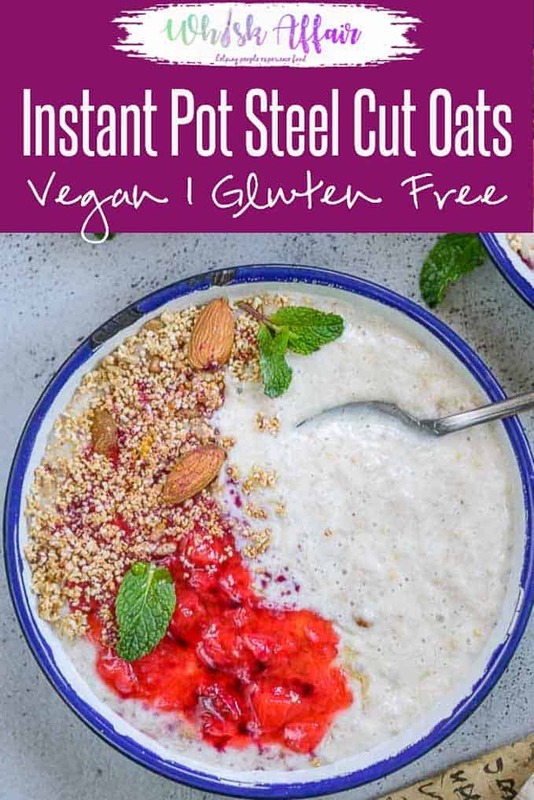 Make these healthy, vegan, gluten free and super easy to make Instant Pot Steel Cuts Oats in under 10 minutes and enjoy a hearty breakfast. Here is how to make Instant Pot Steel Cut Oatmeal. What are Steel Cut Oats? All oats are made from oat groats, that is, the whole grains. The whole grain is then processed into various varieties of oats. Steel Cut Oats are made with the least amount of processing involved as compared to the other varieties. For steel cut oats, the oat groats are chopped 2 or 3 times, and no steaming or rolling is involved. Each variety has a different texture and depending on that the cooking time also varies. Steel Cut Oats are also called as Pinhead Oats, Coarse Oatmeal or Irish Oatmeal. Steel cut oats take the longest to cook and don’t absorb as much liquid while cooking as compared to rolled oats or instant oats. They have a grainy texture after cooking and are nutritious. Steel cut oats have a low glycaemic index and are slow digesting. Thus, good to keep your blood sugar levels in check. They will keep you full for a longer time and are helpful in maintaining weight. Instant pot makes cooking easier and much faster. It saves a lot of time to cook steel cuts oats in an instant pot as compared to the traditional stovetop method. The cooking is handsfree. All you have to do is dump the ingredients in IP and then forget about it. No stirring, no adjusting the heat. It prevents the oats to stick to the bottom and cook perfectly. You can set the instant pot on cooking mode and leave it till the timer goes off. It keeps the oats warm until you are ready to eat. You can make a big batch in one go. Put two cups of steel cut oats and 6 cups of water into the pot of your Instant Pot. Add ground cinnamon, salt and vanilla extract to the mix. Close the lid carefully and set the valve to sealing position. Press PRESSURE and set the timer to 5 minutes. It will take 10-12 minutes for the timer to start. Once the timer goes off, let the pressure release naturally for 15-20 minutes. Open the lid and give the oats a gentle stir. Add honey or maple syrup as per taste and top them with your choice of topping. Serve warm. You can also add some milk, almond milk, or coconut milk to make your oats creamy. I personally like to thin down my cooked oats with little milk and then top it with honey and toppings. The topping options are endless when it comes to steel cut oats. You can make sweet or savoury version as per your preference. 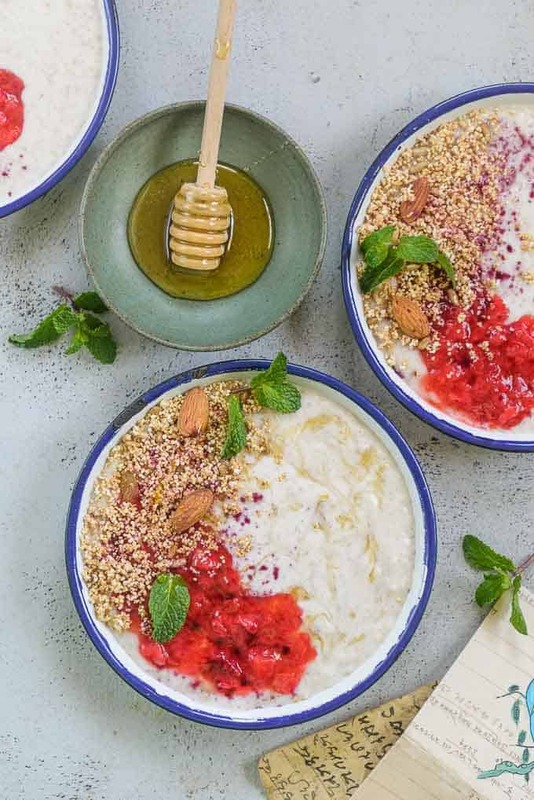 You can top them with fruits, berries, peanut butter, almond butter, nuts, maple syrup, honey, cream, chia seeds, chocolate butter and more for sweet steel cut oats. To make savoury steel cut oats, you can add sausages, cheese, bacon, eggs, chopped vegetables and more. Apple Cinnamon: Chop an apple. Add the chopped apple along with 1/2 teaspoon cinnamon mixed with the water to the pot. Or once the oats are cooked. Pumpkin Spice: Add 1 cup pumpkin puree, 1/4 cup maple syrup, and 3/4 teaspoon pumpkin pie spice with the water and mix well. Peanut Butter–Banana: Once the oatmeal is ready, add 1/4 cup creamy peanut butter and mix well. Top with banana slices and serve. Blueberry Almond/Pecan: Top the oats with fresh blueberries, toasted sliced almonds or pecans, and drizzle some honey or some cream. Savoury Sesame Soy: Add 2 tablespoons soy sauce and 1/2 teaspoon sesame oil mixed in water. Stir well. Serve topped with a fried egg. Gluten Free: Oats are gluten free, but sometimes there could be some factory contamination. To make gluten-free steel cut oat, make sure you use certified gluten-free steel cut oats. 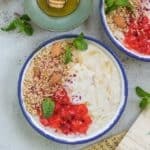 Can you use almond milk in place of water to cook the oats? You can use almond milk to cook the oats. Avoid using the regular milk as it might get scorched while cooking. You can definitely add the regular milk, like I do, once the oats are cooked. To make vegan steel cut oats, you can use almond milk, soy milk or coconut milk. These will make your oats creamy and much more delicious. You can use any non-dairy milk to make a vegan version. How can you refrigerate these Instant Pot Steel Cut Oats? Let the cooked oats cool down completely and then refrigerate to reheating portions. You can refrigerate them for up to a week. I suggest adding a little more extra water to the cooked oats and mix well before refrigerating. The oats becomes thicker after cooling down and you don’t want lumps of oats while eating it. So thinning them down a little before refrigerating helps in getting a nice and creamy oats when you re heat them. Can you freeze Instant Pot Steel Cut Oats? You can also freeze the cooked steel cut oats in individual reheating portions for up to 3 months, and reheat as needed. But make sure you let the oats cool down completely before you freeze them. And same as refrigerating, add some extra liquid to the oats. Breakfast Cannot be better than this. 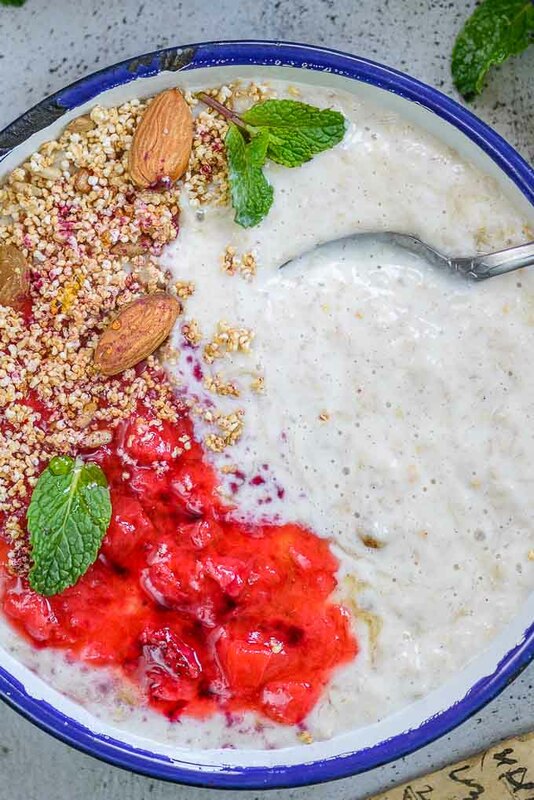 Make these healthy and super easy to make Instant Pot Steel Cuts Oats in under 10 minutes and enjoy a hearty breakfast. 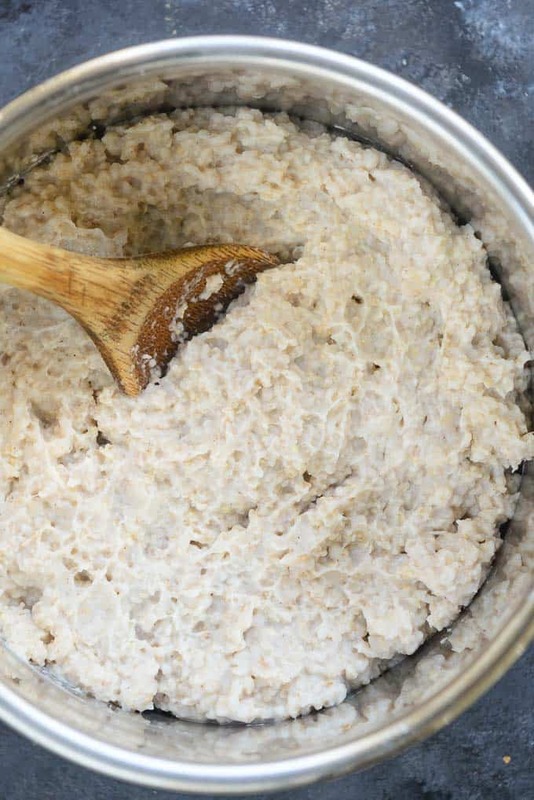 Here is how to make Instant Pot Steel Cut Oatmeal. Add all the ingredients in the Instant Pot. Close the lid and set the valve to sealing position. Press PRESSURE and set the timer to 5 minutes. The timer will take 10-12 minutes to start. Once the timer goes off, make sure to let the release the pressure naturally for 15-20 minutes. Open the lid and give the oats a gentle stir. I personally like to add some milk to the cooked oatmeal. Add honey or maple syrup as per taste and top them with your choice of topping. Are you making this recipe? I LOVE to see your creations so snap a photo and tag Whiskaffairon Instagram with the hashtag #Whiskaffair and please give a star rating below ★. You can follow me on Facebook, Twitter, Pinterest and Instagram for more such easy recipes. *Please note this post may have affiliate links.